Secret Societies in Hawaii, 1914. From the left to right—William Beers, Charles H. Rose, H. Pereira. 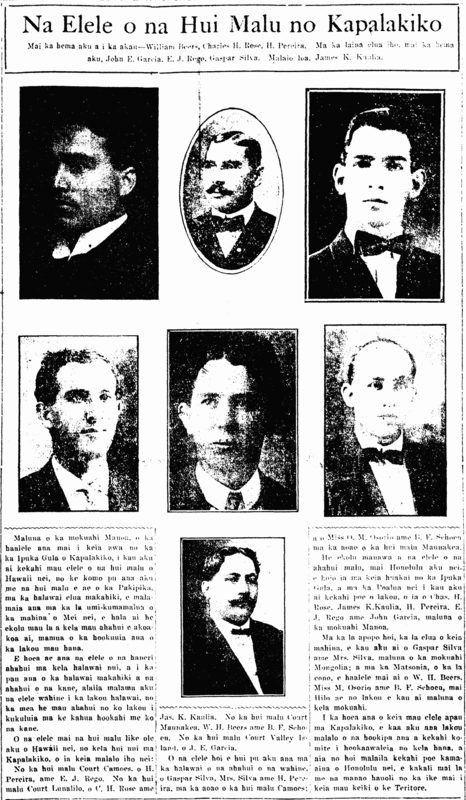 On the second line below, from the left, John E. Garcia, E. J. Rego, Gaspar Silva. On the very bottom, James K. Kaulia. Aboard the steamship Manoa leaving this port for the Golden Gate of San Francisco, rode some representatives of secret societies [hui malu] of Hawaii to join with other secret societies of the Pacific in their biennial meeting being held on the twelveth of this May, spending three days in meetings with these societies before their activities are let out. The representatives of hundreds of secret societies will attend this great meeting, and at the conclusion of the annual men’s gathering, then the women will hold their meeting for they have established societies on the same foundation as the men. From the secret society of Court Camoes, H. Pereira and E. J. Rego. From the secret society Court Lunalilo, C. H. Rose and James Kaulia. From the secret society Court Maunakea, W. H. Beers and B. F. Shoen. From the secret society Court Valley Island, J. E. Garcia. The representatives meeting at the women’s gathering are: Gaspar Silva, Mrs. Silva, and H. Pereira from the Camoes; and Miss D. M. Osorio and B. F. Shoen from the secret society of Maunakea. The secret society representatives from Honolulu will be travelling to the Golden Gate in three trips; this Tuesday, some of them, Charles H. Rose, James K. Kaulia, H. Pereira, E. J. Rego, and John Garcia, boarded the steamship Manoa. Tomorrow, the second of this month, Gaspar Silva and Mrs. Silva will board the Mongolia; and on the Matsonia of The sixth, W. H. Beers, Miss M. Osorio, and B. F. Shoen will leave, and it is from Hilo that they will board that steamship. When all of the representatives reach San Fransico, they will come under the care of a committee set aside for that purpose, and there are people there who are kamaaina of Honolulu who await happily to see these keiki of the Territory. Ka Nupepa Kuokoa, Buke LII, Helu 18, Aoao 1. Mei 1, 1914.